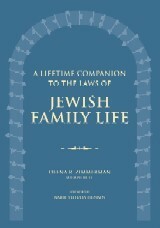 A lifetime Companion to Laws of Jewish Family Life written by Deena R. Zimmerman, MD, MPH, IBCLC helps married - or about to be married - couples of all ages learn about the laws of Taharat Hamishpacha, Family Purity. In addition, particular emphasis was placed on achieving an understanding of the interplay between Jewish Law and women's health issues throughout the life cycle. Softcover.